A reader wants to disable syncing to iCloud, but can't download the full-resolution images and videos. Here's how to fix it. My iCloud Photo Library is enabled, and I want to disable it, since there is very little storage left in my iCloud subscription. It’s not quite a Hobson’s choice, but if you don’t have enough local storage, how can you proceed? While you can up your iCloud storage relatively cheaply, I know many people balk at paying Apple any more money unless they’re making significant use of iCloud synchronization for photos and video, not just as backup storage. However, when Arushi flips the switch in Settings > iCloud > Photos to disable iCloud Photo Library, iOS first notes two choices: Remove from iPhone or Download Photos & Videos. Arushi tapped Download Photos & Videos, but the iPhone lacked enough storage to retrieve the full-resolution media before deleting it from iCloud; the phone was set to use optimized images. Use a Mac to download and then iTunes to sync. On a Mac, enable iCloud Photo Library with the same iCloud account as your iOS device, and open Preferences > iCloud and then choose the option labeled Download Originals to This Mac, if it isn’t already. Once you’re sure the originals are downloaded, uncheck iCloud Photo Library on the Mac, and then disable it on all other connected Macs and iOS devices. All photos and videos will be deleted from iOS, but remain in place on any connected Macs that performed full-resolution downloads. You can then use iTunes to synchronize media with the iOS device. Delete enough storage from the iOS device. Arushi was shy 1.3 GB of local storage, and looking through Settings > General > Storage & iCloud Usage > Manage Storage list can help you find gigabytes to shed, at least temporarily. I have a whopping 9GB of podcasts on my iPhone right now. 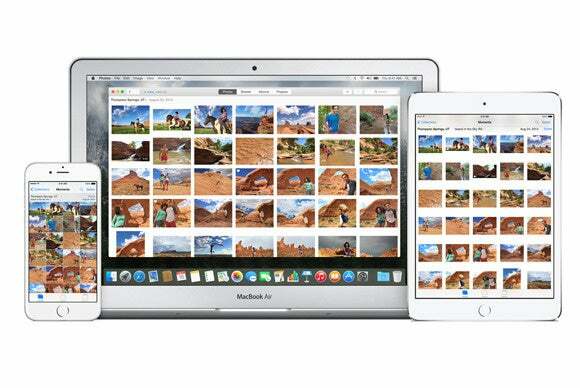 After freeing up the storage, return to Settings > iCloud > Photos and complete the operation to download media. 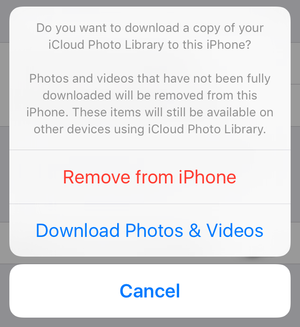 Once the photos are downloaded, you can use any of a number of tools to copy images and movies from iOS, and then delete older ones or otherwise clean out your storage. Delete photos and videos you don’t want. Sounds obvious, but it’s definitely a plan. If you’ve accumulated media you don’t really need to keep, dump some of it. Videos can take up surprisingly huge amounts of storage, sometimes hundreds of megabytes each.